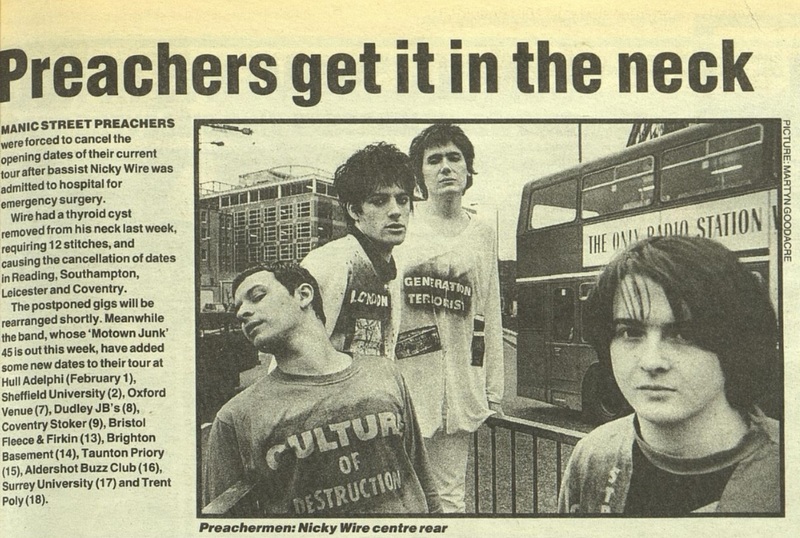 Manic Street Preachers were forced to cancel the opening dates of their current tour after bassist Nicky Wire was admitted to hospital for emergency surgery. Wire had a thyroid cyst removed from his neck last week. requiring 12 stitches, and causing the cancellation of dates in Reading, Southampton, Leicester and Coventry. The postponed gigs will be rearranged shortly. Meanwhile the band, whose 'Motown Junk' 45 is out this week, have added some new dates to their tour at Hull Adelphi (February 1), Sheffield University (2). Oxford Venue (7), Dudley JB's (8), Coventry Stoker (9), Bristol Fleece 8 Firkin (13), Brighton Basement (14), Taunton Priory 15), Aldershot Buzz Club (16), surrey University (17) and Trent Poly (18). This page was last modified on 22 March 2018, at 19:05.